Assistant Secretary Daniel Russel on the U.S. rebalance to Asia, the South China Sea, the TPP, and more. For spring 2015, The Diplomat presents “Diplomatic Access,” a series of exclusive interviews with ambassadors from the Asia-Pacific region. By talking to these diplomats, we’ll give readers a sense of each country’s perspective on various regional economic and security trends — from TPP to the Silk Road Economic Belt; from the South China Sea disputes to the Islamic State. Check out the whole series to date here. 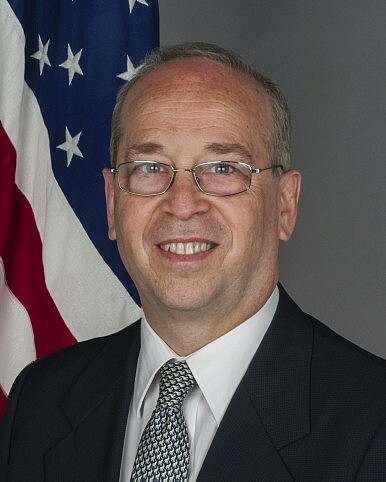 In this interview, Daniel Russel, U.S. Assistant Secretary of State for East Asian and Pacific Affairs, talks about the U.S. rebalance to Asia, the South China Sea, the TPP, and U.S.-China relations. The Diplomat: From the United States’ perspective, what are the greatest threats to Asia-Pacific security? Assistant Secretary Russel: Let me start with what’s going well. From the United States’ perspective there are many great stories to tell in the Asia-Pacific region. The 70th anniversary of the end of World War II prompts us to look back at how much the region has achieved — building peace among nations through dialogue and diplomacy; lifting hundreds of millions of people out of poverty and expanding the middle class; learning to sustain growing populations and also protect the environment; and creating agreements and institutions that enable these accomplishments and can preserve their benefits for future generations. That said, every region faces threats to its security, and we can’t afford complacency. Any failure by a nation in the Asia-Pacific region to respect the rule of law and the norms set by the international system is cause for concern. The region has prospered under the post-World War II system that evolved over the last 70 years. People don’t think about it every day, but international air travel, shipping food and car parts and currency from one country to another, and protecting business investments in other countries — all these things we take for granted depend on respect for rules and international law. When countries act inconsistently with international law, the dangers multiply quickly. For instance, North Korea is flouting its obligations by continuing its illicit nuclear and ballistic missile programs. It must give up the programs that the UN Security Council has banned, and address its grievous human rights violations if it hopes to achieve the security and prosperity it claims to seek. In the South China Sea, multiple maritime and territorial disputes are generating tension. While these disputes are extremely complex, countries have a number of diplomatic and legal tools at their disposal to address them. The United States is not a claimant, but we care deeply about how claims are pursued. We support countries specifying their claims and the basis for them in accordance with the UN Convention on the Law of the Sea. We support the right of countries to take cases to international tribunals, as the Philippines has done in a dispute with China under the Law of the Sea Convention, although we don’t support one claimant’s position over another’s. And we oppose coercion or the threat or use of force by any claimant to resolve disputes. We oppose actions by any party that complicate or escalate disputes and negatively affect peace and stability in the region. Actions such as land reclamation or militarization of disputed outposts have this effect, and they run counter to the letter and spirit of the Declaration of Conduct that China and the ASEAN nations signed in 2002. We’re also addressing threats by strengthening norms in fields where they are not yet well developed. For instance, we are working with partners throughout the region to curb the travel of foreign terrorist fighters, block recruitment by radical extremist groups, strengthen cybersecurity, and combat transnational crime. Some countries are threatened by the instability that rises from a failure to give citizens a meaningful say in how they’re governed. Good governance, strengthening the practice and institutions of democracy, allowing peaceful protest, letting non-governmental organizations (NGOs) function freely, respecting universal human rights — all of these actions promote stability and, I believe, foster economic growth. So we encourage governments to engage constructively with civil society. What can be done to address these threats? Addressing threats to security, stability, and freedom requires cooperation, resources, and persistence. These stronger relationships are reflected in the important agreements we’ve reached with allies including Japan, Australia, the Republic of Korea, and the Philippines in the last two years, which enhance our ability to operate jointly and give us improved access to facilities across the region. The new normal of stronger relationships helps us protect American interests, lowers barriers to cooperation, and gives us opportunities to push for faster progress on issues like opening markets and increasing respect for human rights. Next, resources. We’ve invested billions in diplomacy and development under the rebalance. At the same time, we’re also working with allies and partners to make the long-term investments needed to modernize our security presence in the region. And we’re working with other partners who are investing in areas like maritime capacity. These coordinated investments are vital for a range of missions from fisheries protection and disaster response to countering piracy and maintaining freedom of navigation. The third key to countering threats is persistence. Building up and enforcing rules and norms doesn’t happen overnight. We’ve been working on this for 70 years, and it’s still a work in progress. As the region’s economy changes and new powers emerge, we have to make sure that the international system is fair and inclusive. So the president has invested his time, and our diplomatic energies, in building up regional institutions such as APEC, ASEAN, the ASEAN Regional Forum, and the East Asia Summit (EAS). By supporting EAS as the premier forum for discussing security issues, we’re establishing that security issues in Asia should be handled collaboratively in a regional setting, and not through intimidation or force. Institutions such as the EAS subject all members regardless of their size to the same sets of expectations and also to the peer pressure of membership. With the right of membership comes the responsibility for contributing to the preservation of regional stability. We’ve shown persistence across a wide range of long-term issues, from blocking proliferation to countering violent extremism to combating climate change. That persistence pays off. We’re putting unprecedented pressure on the North Korean regime while maintaining strong unity among our partners in the Six-Party Talks. We have helped our partners degrade local terrorist groups in the region over the last decade, and more recently worked with many Asia-Pacific partners to counter ISIL. And our sustained efforts with China on climate issues led to last year’s joint announcement of climate targets. That agreement, in turn, should help pave the way to productive global climate talks in Paris later this year. In his State of the Union address, President Obama called for the United States to “write the rules” for Asia-Pacific trade. How does the Trans-Pacific Partnership embody the U.S. vision for Asia-Pacific trade? What is the U.S. stance on other proposed regional trade blocs (from the Regional Comprehensive Economic Partnership to the Free Trade Area of the Asia-Pacific)? To understand the President Obama vision, let’s start with a bigger question: How can we ensure that the Asia-Pacific will build on the open, transparent, rules-based system that has been the foundation of the region’s tremendous economic and social advancement over the last 70 years? The Trans-Pacific Partnership (TPP) is a very big part of the answer, because it is a market-opening trade agreement, but it is also much more. It is a labor agreement, it is an environmental agreement, it protects the innovation economy, and it is a concrete manifestation of our rebalance to the Asia-Pacific. And it covers 40 percent of global GDP and one-third of global trade. Let me explain. If you stripped out all of the trade provisions in the TPP and just left the environmental parts, it would be an unprecedented, strong, and fully enforceable environmental treaty on its own. It’s got provisions for protecting marine mammals, preventing wildlife trafficking, and promoting sustainable fishing. It penalizes illegal, unregulated, and unreported fishing, and economic policies that foster bad maritime resource management. And it has sanctions to ensure compliance. The chapter on labor standards could also be a stand-alone treaty. It protects freedom of assembly and the right of collective bargaining — the right of labor to organize. It’s got protections against child labor, against the kind of slavery that’s being reported on in the fishing industry in Southeast Asia. TPP’s provisions on the Internet economy will help protect the 40-million-and-growing jobs in the U.S. based on digital industry and exports. It protects the free flow of data across borders, which is hugely important to all of us. It’s got a chapter specifically dedicated to sustainable development and poverty alleviation. And the strategic significance of the agreement is huge, because it gives members economic choices. The TPP expands market access and helps members diversify their economic relationships. At the same time, TPP is an open platform, meaning that other economies that can meet TPP’s high standards and rigorous enforcement mechanism will be able to join. Certainly not every country today can meet TPP’s high standards. But I believe the world will be a much better place when other countries are able to meet those standards, and when countries in the region have safeguards against economic coercion or exploitation. We are at the final stages in the negotiations, and I’m absolutely convinced that the leaders of the 12 partners are determined to bring this to a close soon — this year. On the last part of your question, the United States broadly supports efforts to increase trade, investment, and economic openness. Proposals like RCEP are not mutually exclusive with TPP, the ASEAN Economic Community, or with further integration through the WTO. Still, we see TPP as the most promising pathway to a Free Trade Area of the Asia-Pacific, and the approach likely to achieve the most significant economic results. While the rebalance has important economic and diplomatic components, there’s undeniably a military aspect as well, as the U.S. seeks to strengthen its formal alliances and deepen other regional partnerships. From the U.S. perspective, what is the end goal of the military arm of the rebalance? President Obama’s strategic rebalance has a security component as well as economic, diplomatic, and values-based elements. It’s important to remember that our system of alliances and partnerships has undergirded enduring peace and created favorable conditions for rising prosperity in the region for decades. So it’s natural that partners across the region view our presence as a positive, stabilizing influence, and they continually tell us that they want us to stay. The best way to understand our military presence is in the broader context of the rebalance. Rather than an “end goal,” we have an “ongoing goal” of maintaining good, mutually beneficial relations with a dynamic, prosperous, peaceful Asia. This is the “new normal” of U.S.-Asia relations, and I think there’s a growing realization of it in the region as well. The U.S. has vital national interests in the Asia-Pacific and we’re here to stay. The TPP, the near-constant stream of high-level visits, our unmatched levels of business investment, our increased aid budgets, and the security presence all help to demonstrate America’s enduring commitment to Asia. At Arizona State University in April, our new Secretary of Defense Ash Carter gave a speech about the Asia-Pacific and his personal commitment to it, which I recommend to your readers. In it, he spoke about “the next phase of our rebalance,” which, for our military, has four parts: first, investments in future capabilities such as new weapons systems; second, deploying some of our most advanced existing systems, like new submarines and surveillance aircraft; third, adapting our posture to be spread more evenly across the region; and fourth, reinforcing our alliances and partnerships. These last two are related, because our posture is based on access to facilities across the region. We have major construction projects to modernize facilities in Japan and Korea, and agreements to rotate our forces through the Philippines and Australia. And we’re on pace to have 60 percent of our Navy based in the Pacific by 2020. Through both our alliances and partnerships, we are focused on enhancing our partners’ capacity to address growing regional challenges in areas such as missile defense, cyber security, space resilience, maritime security, and disaster relief. The events of the past year have raised concerns about human rights and the strength of democratic institutions in a number of regional countries. How can the U.S. engage productively on human rights issues in the region? Have we seen any progress thus far? You are right to ask how we “engage productively” on human rights and democracy. We want to win the competition of ideas, to convince countries that government based on the consent of the governed and respect for the inalienable rights of all persons is the truest and best path to progress, stability, and prosperity for any and all nations. We stand up for human rights and democracy in many ways: We forthrightly discuss differences and stand up for universal values. We speak out in private with leaders, and in public, about specific cases where countries are not living up to their commitments. We meet with leaders of non-governmental organizations and civil society institutions — when senior officials visit, and on a regular basis through the work of our dedicated diplomats at posts around the region. It’s all part of keeping the faith with brave advocates facing down oppression in their countries. And we work with partners to expose the worst rights violators, such as North Korea. To answer your second question: Yes. Many countries have a long way to go, but we’ve absolutely seen progress. Japan, South Korea, Australia, and Taiwan set great examples for democracy and respect for human rights. Democracy has matured and respect for human rights has increased in the Philippines, Indonesia, and Mongolia. Even though there’s a lot of work to do and success isn’t guaranteed, Burma’s democratic transition is moving forward. In Cambodia, civil society is thriving; since the 2013 election, there is a healthier balance between the ruling and opposition parties — but additional reforms are needed to cement democracy. Vietnam has ratified an international agreement enshrining the rights of persons with disabilities, signed the Convention Against Torture, and is making progress on other human rights issues. This is another area where persistence pays, so we will continue our principled diplomacy in support of universal human rights. Some analysts believe China is creating a new network of regional institutions to rival and perhaps even replace the current U.S.-led alternatives. How does Washington interpret Beijing’s new initiatives? Can the U.S. and China avoid a strategic competition for regional leadership? As President Obama has emphasized, a stable, prosperous China that contributes to the international financial system is in America’s interest. China’s progress benefits our own, and vice versa. I think the issue of the Asian Infrastructure Investment Bank (AIIB) has been formulated as a sort of zero-sum tug-of-war. That’s unfortunate because the reality is very different. Two, China has abundant foreign exchange reserves, and it is good that they want to invest around the region. We welcome that. Three, any new institution, including the AIIB, needs to do right by the people and communities where their projects are being built. New institutions need to meet the same high standards that existing institutions meet — standards and safeguards that support sustainable development by curbing corruption, preventing environmental damage, protecting workers, and having all member countries participate in decision-making. Four, if the AIIB meets these standards, then we’re all for it. Any notion that the U.S. opposes the AIIB or other countries participating in it is not true. Over the last year or so, China and the prospective members of the AIIB have said that they want the AIIB to adopt sound governance practices and the environmental and social safeguards of the existing MDBs. Our hope is that this will lead to concrete commitments enshrined in the AIIB’s founding documents. And once it does — and this brings me to President Obama’s fifth point — we look forward to collaborating with the AIIB, especially through the Asian Development Bank and the World Bank. So, in short, we support China playing a constructive role in regional and global affairs — and we are working with China to help it do just that. Around the world, we are cooperating with China on important issues such as piracy, peacekeeping, pandemic disease, and climate change, and we will continue to do so. We will build on these areas of cooperation, even as we work to constructively manage our differences. We believe that provides the best path to developing a productive relationship with China. Advice on how the United States should approach Asia, from the CEO of the Raddington Group. Regional Security Stakes In Southeast AsiaA Chinese Perspective on Obama's Asia PolicyEvaluating the 'Rebalance to Asia': Interview With J. Stapleton RoyObama, Xi Put Positive Spin on US-China RelationsU.S.-China Relations: What Now?